This concert season is going to be an extraordinary as our singing heartthrob Thomas Rhett is coming up with his new 2019 tour. 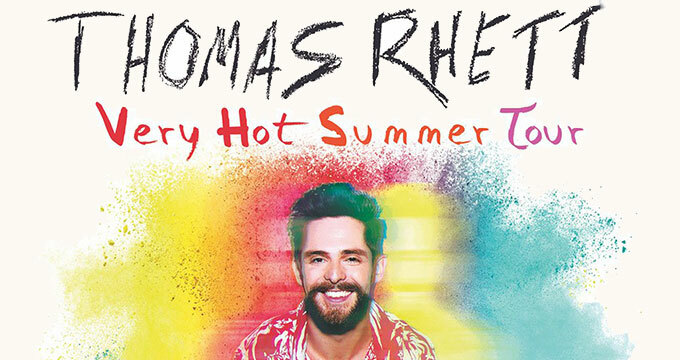 Singing sensation Thomas Rhett is soon going to host "Very Hot Summer Tour", which will include nearly 40 stops. There will be both day and night shows in the musical journey of Thomas Rhett for the year 2019. This tour is going to start in May 2019 and will go coast to coast. The announcement of the tour came roughly one year after the release of Rhett’s third album, "Life Changes", which features a few of the top-rated songs, such as "Unforgettable", "Craving You" and "Marry Me". The most of the weekends in June and July followed by August and September will be used up in Thomas Rhett tour schedule. If you are a die-hard fan of Thomas Rhett, you cannot afford to miss the upcoming Thomas Rhett tour 2019. After delivering numerous successful concerts in the past, another tour schedule of Thomas Rhett in 2019 is waiting to drive the audience of United States crazy all over again. It is going to be one wild ride for the fans and there is no reason for his fans to miss out the tour. The loud and lively singing of the country singer completely spell-bounds the audience every time he is on stage. This time as well Thomas Rhett tour is going to greet the fans with his heartfelt music and soulful singing. In a press-release, Rhett showed his curiosity for the tour of 2019 and said: "I'm glad we have the winter to plan and come up with some crazy stuff for next year because I can’t think of a better way to spend the summer than out on the road with my fans". Country singers Russell Dickerson and Dustin Lynch will be the tour openers for Thomas on his upcoming tour. Thomas’s father, Rhett Akins, is also accompanying his son Thomas Rhett on his all the tour dates in 2019 to make the tour more happening. All these amazing singers will be collaborating to give unforgettable performances during the tour. According to the announcement made by Thomas Rhett, his tour lineup will start from the month of May 2019. The tour for the show is scheduled to launch on May 17 in Spokane of Washington and will continue up to October 12 before returning to home in Nashville. In the months of June and July, he will be performing only on the weekends. However, you will see concentrated efforts during August and September. Meanwhile, Thomas Rhett has his scheduled dates for playing CMC Rocks in Australia during March, and will be performing across different regions of Canada during April and before the beginning of May. There are a handful of festival dates scheduled between stops in his tour. Tour dates are not the only dates Rhett will be performing in the year 2019 rather he is scheduled to play CMC Rocks in Australia and also has set dates across Canada throughout April and early May. Until now, the singer has not made any announcement about any of the singing venues for the new tour, but Rhett has headlines about arena-size venues throughout 2018 on his Life Changes Tour. Initial selling of tickets began in November, 2018. Fans will also be able to nab the seats from January 25, 2019 for the select stops.